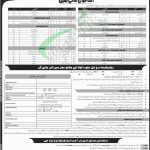 Get Pakistan Railways Jobs 2018 Download Online Application Form Latest. Applications are invited from a Federal Govt body namely Pakistan Railways which is looking for self-motivated, caliber and educated applicants on a permanent basis for the Civil Districts under Pakistan Railways Rawalpindi Division. The positions which are vacant to be recruit in Pakistan Railway Jobs 2018 Advertisement (Signal Muawan, Trolly Man, Chowkidar, Electrical Muawan/RTL, Electrical Muawan/Power, Tracer, Gatekeeper, Gangman, Works Muawan, C&W Muawan, Sweeper, C&W Cleaner, Sweeper, Pointsman (Loco), Call Man (Loco), Telecom Muawan, Driver (Telecon), Junior Assistant Train (JAT), Pointsman (Traffic), Gate Man, Traffic Muawan, Lamp Man, Call Man 9Traffic), R-R Bearer (Traffic), Box Porter, Ticket Collector (TCR-I) Gr.I, Commercial Group Student, Sweeper (Commercial), Sale Man, Luggage Porter, WR Bearer (Commercial)). Applicants from the Civil Districts under Rawalpindi Division are eligible to apply and the name of districts is given below. Now, in the following, we'll discuss the detailed requirements for the positions and Pakistan Railway Jobs Application Form 2018 is also provided below. Applicants wanted to apply should be at least FA/FSc/Matric/Middle/Primary pass for the relevant post. Age of applicants should be between 18 to 25 years and 5 years relaxation in age is allowed by Pakistan Railway. Following are those districts from where individuals can apply for Pakistan Railway Jobs 2018 Rawalpindi Division. Applicants willing to apply are suggested to download the Railway Jobs Application Form from www.JobsAlert.pk. Filled Application Form along with attested copies of CNIC, Domicile, Character Certificate, Educational & Experience Certificate, three photographs “1x1” and three postal envelops should reach the following address given below. Pakistan Railways Jobs 2018 last date of submission of application has been extended from December 10 to December 17, 2018. Position applied for and Name of Applicant with Complete Address should be mentioned clearly on the back of an envelope. Only eligible candidates will be contacted for the test/interview. Stay in touch with us and keep visiting our site JobsAlert.pk for further updates to get marvelous job opportunities today tonight and every day and every time for all sectors jobs. Last Date To Apply: December 17, 2018. Address: Pakistan Railways, Divisional Office, Rawalpindi.